Star Wars: The Force Awakens has long been rumored to be using the rocky isle of Skellig Michael in Ireland as the location of Luke Skywalker's Jedi retreat. More credence has been added to that idea this week, as Mark Hamill arrives at the location to shoot some of the first scenes for Star Wars: Episode VIII. The cast and crew of the next Star Wars sequel have gathered in County Kerry for some scenes being shot off the coast in advance of the full production schedule kicking into gear later in the year. Skellig Michael was used extensively in Star Wars: The Force Awakens. 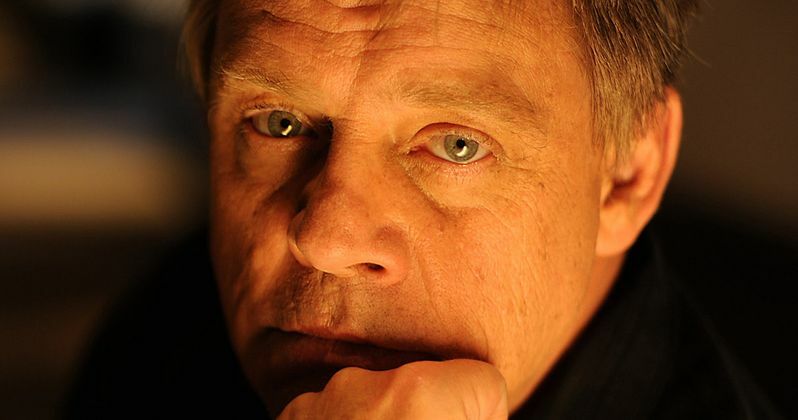 The first time around, sources reported seeing Mark Hamill, who plays Master Jedi Luke Skywalker, at the location along with Daisy Ridley, who plays Rey. Daisy Ridley has not yet been spotted at the location as these first scenes from Star Wars: Episode VIII gear up for production. No shooting has happened just yet. As it turns out, production was halted due to serve weather conditions and sea swells. Skellig Michael was not accessible by boat for the crew to safely arrive at their point of destination yesterday. All filming was postponed until today. The area is hosting a crew of around 100 people. This includes Mark Hamill and several other unidentified cast members. Filming is expected to continue throughout the week, with ships leaving from Portmagee daily. Mark Hamill's son Nathan was seen checking into the Butler Arms Hotel in Waterville yesterday afternoon. The actor's three children also accompanied him on the shoot last year for Star Wars: The Force Awakens. The crew is only allowed to shoot on Skellig Michael throughout the month of September, with the production greatly helping the Irish economy. While Mark Hamill and his family are stationed at the Butler Arms Hotel, other local establishments are also getting in on the business. Some crew members will be housed at the newly refurbished Sea Lodge Hotel, which is also in Waterville, while others will be holed up at the Ocean View holiday village in Portmagee. That particular establishment has been booked out for the duration of the shoot, with security placed on duty around the clock. Lucasfilm and Disney were granted permission to only shoot for a small amount of time on Skellig Michael, with some locals trying to shut it down. As it turns out, they couldn't have picked a worse date to begin production, as it is one of the harshest seasons ever recorded by the boat operators who are helping to carry the crew to and from the island. A security crew has also been stationed at Con O'Shea's farm on Valentia Island. One of the concerns from locals was the amount of helicopter flights the film crew would need to complete their task, which could harm the bird population. Mr. O'Shea is a retired lighthouse keeper stationed on Skellig Michael and his property has the only helipad on the island. This will help facilitate and limit the amount of helicopter rides. The crew is only allowed four per day. The helicopters are currently allowed to operate between Kerry County and the Unesco World Heritage Site, with only director Rian Johnson and the most key figures of the production team utilizing this means of transportation. The area has been quite crowded with tourists, and many of them are asking for details about the shoot. Mr. O'Shea had this to say about the experience. "People who are arriving in this area do seem to know a lot about it and September has been busy and there's a great buzz around the place. They're asking questions but the information we have is limited because anyone involved locally has signed confidentiality contracts but we know that what's happening this week is geared for two years' time and the release of Star Wars Episode VIII." Mr. O'Shea went onto say that a Star Wars wing may be added to the Unesco World Heritage Site because of the interest in the shoot. Locals in the area are already selling out their 'Skellig Wars' T-shirts. Most are going to Star Wars fans in their 50s and 60s. The hope is that Disney and Lucasfilm will agree to let official Star Wars merchandise be sold in the tourist shops around the shooting location. As of right now, it has not been revealed what Skellig Michael will double for in Star Wars: The Force Awakens and Star Wars: Episode VIII. It's believed that the area won't even make it on screen until the third act of the film, when the new heroes finally locate Luke Skywalker in his hideaway.